If you haven’t already done so already, you are going to want to fire up your Starbucks app and grab their latest free Pick of The Week. 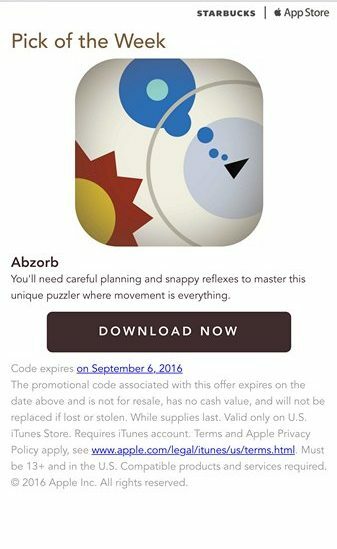 This week’s free iOS app is a brilliant tilt-based arcade/puzzle game by developer Gerald Kelley called Abzorb. In Abzorb you are racing against the clock, tilting your device to move your pointer around the screen, evading the red orbs, while consuming all of the blue orbs by getting as close to them as you can without actually touching them. Cool new, changeling gameplay elements are introduced as you progress though the game’s many levels. Some orbs will shrink you, while others will make you grow, making it more difficult to avoid the red orbs or other dangers. This is an excellent game that is not to be missed and it is FREE for the very first time, as the current “Pick of the Week” within the official Starbucks app. You don’t even need to visit a Starbucks store to save yourself $2.99, just launch the Starbucks app (or go to your message inbox) and you should see it in your list of offers. Click ‘DOWNLOAD NOW’ and it’ll generate a promo code for you to get the game for FREE. If you still want the coffee, order online via the app and use the savings to buy a latte…everyone wins! It looks like the codes are good through September 6th. You can also listen to my thoughts on Abzorb on episode 170 of our weekly podcast. Brett is a 40-something year-old software engineer, gadget geek, Founder/ Editor In Chief of AppAddict.net, husband and father of two little girls. He is a fan of all types of apps, especially adventure games and boardgames. (Devices Owned: iPhone X & iPad Pro 9.7"
You can follow Brett on twitter at @otggamer. all sorts of items for great prices! AppAddict.net Does NOT Condone The Piracy of iOS Apps! It has come to our attention that a software piracy site is operating under the name of 'AppAddict.org'. WE ARE IN NO WAY AFFILIATED WITH THESE CRIMINALS! You should support the development community, BUY APPS, DOT NOT STEAL THEM! Remember, even if it is for trial purposes, it is still illegal. Copyright © 2018 - AppAddict.net - All rights reserved.